After years of conflict, Syrians are facing the largest humanitarian crisis in the world, with grave protection and human rights violations occurring daily. By November 2017 over 6 million children inside Syria were in need and 2.5 million were living as refugees in neighbouring countries. Food insecurity, living under siege, being out of school, poverty, lack of health facilities and an urgent need for water and sanitation are just some of the mammoth challenges facing young Syrian children and their families. According to our charity partner Unicef Ireland, whom we have supported since 2015, Syrian children are at serious risk of becoming a ‘lost generation’. From 2015 to 2017 we prioritised humanitarian aid to this vast crisis through Unicef Ireland’s Syrian appeal. Their teams on the ground provide the essential services needed to minimise the impact of this horrific crisis on Syrian children and young people. 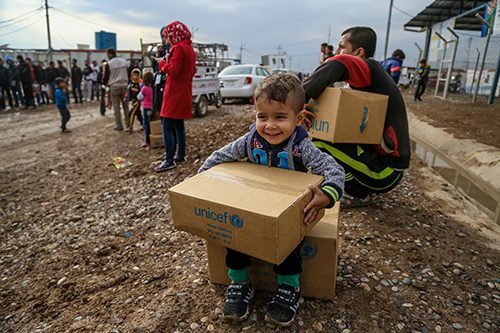 Children supported by Unicef’s Syrian Appeal children have been provided with clothing, nutritional items, water, education, protection, psychological help, health supplies, and medicine. We are only one of many partners joining with Unicef to address the scale of this problem but are proud to have played our part thanks to your outstanding support.